It has successfully achieved its crowd-sourcing target of $50,000 on Indiegogo. Infact, it has even breached it. Right now, this sleek hardware device has received more than $135,000. 3,731 people from all over the globe have placed pre-orders of 6000 units as of now. And this is just the beginning. Prominent technological publications have covered this development, and there is intense speculation all over the world. Once the shipments start from mid-December, it is expected to pick up more steam. 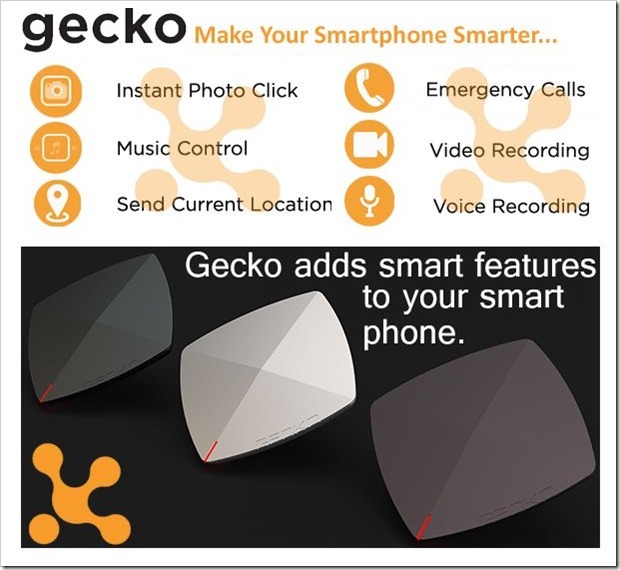 Gecko is a low powered Bluetooth device which can “make your smartphone smarter”. The size of a silver coin, this device has been created by Connovate Technologies, a tech startup based in Bangalore. It was founded by four entrepreneurs: Bahubali Shete, Kiran Kumar, Rajeev M and S Varadarajan in January, 2013. On Sept 11th 2013, they started a campaign on crowd-funding platform Indiegogo, and sought $50,000 funds for its development and finishing. Within one month, that is by October 11, 2013, it had successfully achieved its goal of raising $50,000. November 2, 2013 was the last day of participating in this campaign, and before it closed down, more than $135,000 was collected. Costing only $20 or Rs 1200, Gecko’s low-powered Bluetooth device can be attached to valuable items such as your wallet, your car, your suitcase etc. If any one these items go missing, it can be instantly tracked using Gecko. Attach Gecko with your DSLR camera. Now get into the frame, and just wave your hands. Gecko will catch the senses, and click the picture for you. On your mobile, you can set gestures and actions which will be stored on Gecko. For example, you set a shaking motion for reading SMS on your phone. Now, everytime you shake your mobile, you can read your SMS directly. You can sync your music system with Gecko and even when you are in bathroom, taking bath, you can control the songs and play your favorite music, seamlessly. India has primarily shown its expertise in creating software and offering services for western multinationals. In recent times, no hardware device has been born inside India, which has been able to create such a craze all over the world. And moreover, Gecko has been successfully crowd funded on Indiegogo, which is in itself a huge achievement. What is your take on Gecko? Can it make a dent in the universe with its versatile usage and features? Do share your views by commenting right here!